Special Containment Procedures: SCP-3798 is to be kept in a standard containment cell and left on at all times. A single camera is to be placed 1.5 meters in front of SCP-3798’s screen to monitor for any changes in the contents of SCP-3798. A microwave receiver is to be placed adjacent to SCP-3798; all signals received are to be digitally stored and copied, with copies of short-timeframe signals translated into the ISO basic Latin alphabet from standard Morse code. Description: SCP-3798 is a 1990s-era TV set with a VHS player containing a single tape of 1998’s Baby Mozart: Music Festival children’s educational film. SCP-3798 does not play any other films inserted in its player, and furthermore does not play the original contents of the tape; the tape has been proven to play normally in control tests. SCP-3798’s anomalous effects do not occur if a different version of the same tape is inserted; like other tapes, it will simply not play. SCP-3798’s anomalous effects only occur when the original Baby Mozart tape is inserted and the set is turned on. At this point, a black screen will be displayed which is occasionally interrupted by still images which appear to be from the tape, though some images have appeared which do not seem to originate from any version of Baby Mozart. SCP-3798 will also occasionally emit bursts of microwave radiation at a frequency of 1420.406 MHz.1 These emissions have only been detected while a still image is displayed on SCP-3798. The source of the emissions of radiation by SCP-3798 appears to be an undefined two-dimensional space that exists between the front plate glass and the dielectric layer of the TV set. This space only appears when the aforementioned conditions have been met. The source of this space is unclear, and it appears unresponsive to stimuli. Signals emitted by SCP-3798 are relayed in short bursts of 0.25 seconds and 1.02 seconds, which together correspond to letters and numbers in Morse code (0.25-second signal representing “dots” and 1.02-second signals representing “dashes”). In short timeframes, these codes have been shown to translate to English language sentences. A full transcript of images displayed and text received from SCP-3798 is listed in Addendum I.
Foreword: The following is a log of images and text received from SCP-3798. Images and observations of the physical state of SCP-3798 are italicized, while text received in Morse code via SCP-3798’s microwave emissions is presented as regular text. Singular microwave emissions are noted in italics. [03/16/0█, 05:19:22]: SCP-3798 displays a black screen. No signals present. 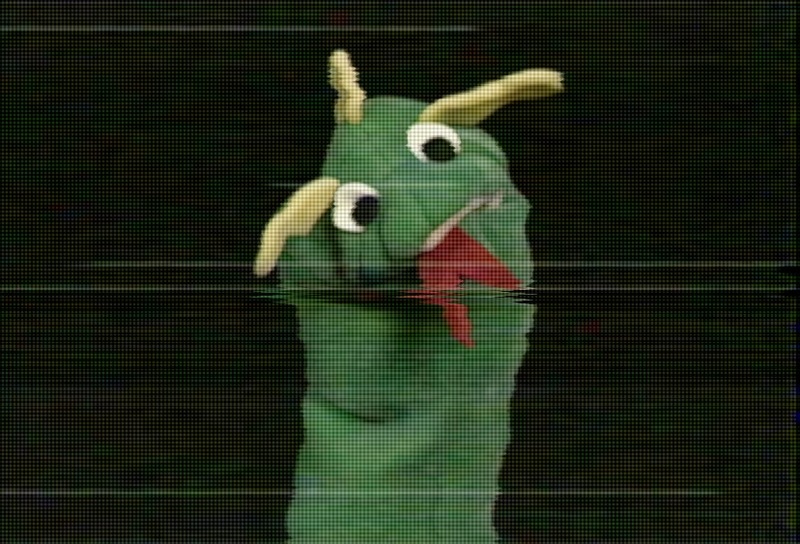 [05/17/0█, 23:53:30]: SCP-3798 displays a still image of a dragon puppet. [05/17/0█, 10:22:00]: SCP-3798 emits a 1.02 second microwave signal. [05/17/0█, 11:35:16]: SCP-3798 emits a 0.25 second microwave signal. [05/17/0█, 12:04:28]: SCP-3798 emits a 0.25 second microwave signal. [05/17/0█, 14:08:25]: SCP-3798 emits a 0.25 second microwave signal. [05/17/0█, 21:01:00]: Image returns to black. [06/15/0█, 05:45:19]: SCP-3798 displays a still image of a lit candle. 1. This frequency is equivalent to the spectral line that is created by a change in the energy state of neutral hydrogen atoms. It is observed frequently in radio astronomy, since radio waves of this frequency can penetrate opaque interstellar dust clouds.